When Mercedes-Benz Financial Services opened its doors on April 1, 1997, it had a mere handful of staff. Today it boasts a staff complement of 190 employees. 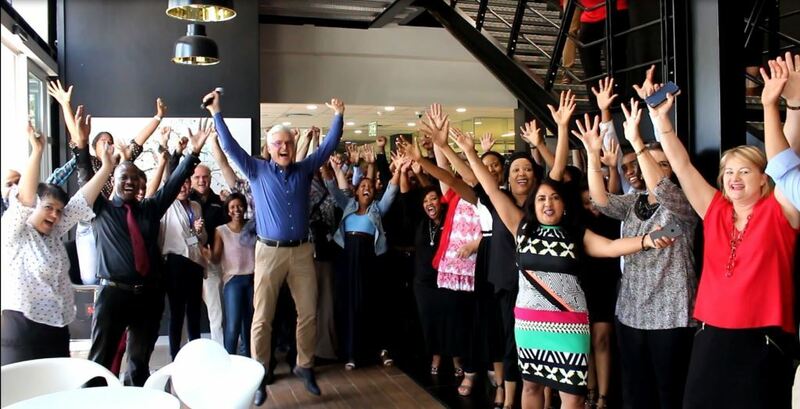 Here, Joerg Essig, Chairman of Mercedes-Benz Financial Services, is surrounded by some of the staff as they celebrate their 21-years milestone. Mercedes-Benz Financial Services (MBFS), a wholly-owned subsidiary of Mercedes-Benz South Africa (MBSA), celebrates 20 successful years of operation this year. MBFS first opened its doors on April 1, 1997 starting out small with a handful of personnel. It now boasts a staff complement of 190 employees. Over the years, the captive finance company has transformed vehicle financing by developing many products to suit the South African economy, satisfying both the commercial vehicle and passenger car markets. In 2016, MBFS added a total of almost R9.5-billion worth of acquisitions which resulted in an all-time high portfolio of R28.6-billion. In a study conducted by Nielsen in 2016, MBFS was ranked Number 1 in the Dealer Satisfaction Index, leading competing banks by a healthy margin. MBFS Passenger Cars scored 89% – 10% ahead of its closest competitor – and MBFS Commercial Vehicles 85% – 16% ahead of its closest competitor. MBFS ranked Number 1 in the Customer Satisfaction Index compared to competing banks. “These results are testament to the commitment that our passionate and dedicated dealer partners have for the brand. Mercedes-Benz Financial Services is committed to understanding our customers’ changing needs and offering financial products and services that provide the flexibility and convenience they have come to expect from MBFS,” says Joerg Essig, Chairman of MBFS. With twenty years of success, MBFS will continue to grow its core business and with new financial products in the pipeline, the company is excitedly looking forward to what the future holds. “In this rapidly changing digital world, we are focused on digitalising the customer journey. We are also creating new fascinating finance products that are possible because of our highly engaged and motivated employees, including our dedicated business partners. These new products will enable us to further excite and service our dealers and customers for the next twenty years,” Essig says.